Asparagus Carrots Olives Onions Pasta Primavera (Brown Rice Elbows and Lemon Sauce) is tasty vegan recipe that can also be served cold as a pasta salad. This recipe, which serves 6 adults as a main meal, can be prepared in a large covered dish in the microwave oven, in a large pot on the stovetop, or in a wok. Initial reparation time is about 20 minutes, and cooking and final preparation time is about 30-40 minutes. Wash and remove the bottom 1/2 inch of the asparagus stalks. Cut into 1 to 1-1/2 inch long pieces and place in large covered baking dish (for microwaving), or in a wok, or a large covered pot for steaming on the stove top. Wash and peel the carrots. Cut into slices and add to the cooking dish, wok, or pot. Peel and cut the onion into small pieces (not diced) and add to the cooking dish, wok, or pot. If cooking in the microwave oven, cook for about 15 minutes on “high” (mixing every 5 minutes) until the onions start becoming semi-translucent. If cooking on the stove top, add a little water and steam on medium heat (mixing every few minutes) until the onions start to become semi-translucent (add a little water as needed to prevent sticking and burning), Reduce the amount of water in the sauce by the amount remaining in the pot. When the water in the pasta pot begins to boil, add the brown rice elbows and cook until the pasta is tender but still a little chewy. At the same time prepare the sauce in a blender. Add the water, lemon juice, garlic (if desired), hot red pepper, oregano, and 3 tbsp. corn starch. Blend at high speed until smooth. Slice the olives, if they are not already sliced in the can, and set aside. When the asparagus, carrots and onions are cooked, add the lemon sauce and olives and cook again until the sauce thickens. If the sauce is too “watery”, add another tbsp. of corn starch dispersed in a little cold water or lemon juice as desired and mix in. If necessary heat again to make sure the corn starch is dissolved and the sauce thickens. Add the cooked and drained pasta and the olive oil (if desired) and mix thoroughly. 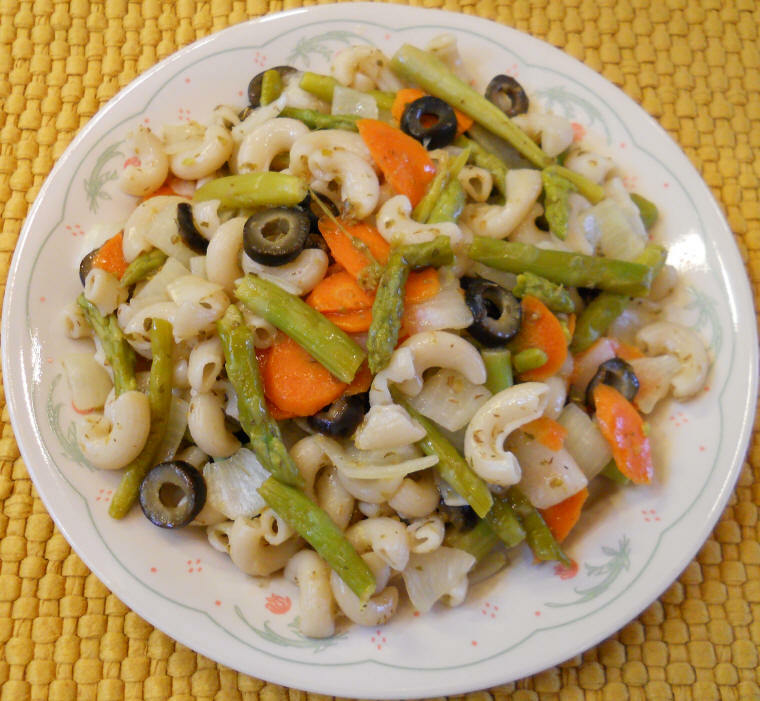 Leftover Asparagus Carrots Olives Onions Pasta Primavera (Brown Rice Elbows and Lemon Sauce) can be stored in the refrigerator in a closed container for a few days, and they are great reheated, or served cold as a pasta salad.